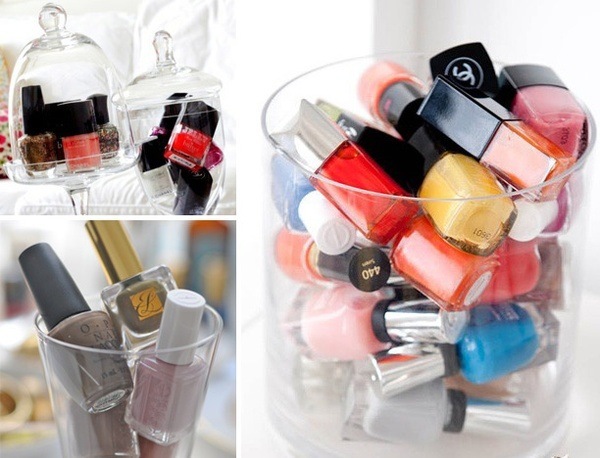 Amassing a collection of nail polishes, and stowing them neatly under our vanities or in closets is something most of us do, right? We buy them in pretty colors, and when they are all together is looks like a little party of polishes - so, if we liked these colors enough to buy them and wear them, why shouldn't we show them off at home too? Anytime you add clean and bright glassware, especially in apothecary form- it instantly gives a tablescape a little pizazz. I think its the perfect hint of glamour and color to add to your dressing space! Not to mention... it frees up a little storage space! I just love this idea!! I'm going to have to try it! Ohhhh I need to put my nail polish in a canister right now. I see this is from uber long ago, but I would like to tell you because of this post I do this, and am going to post it on my blog this week :) It's such a fun, chic, cheap and easy idea that packs such a punch!